We almost have no time to breath at this moment. Setting up the office takes more time than expected and at the same time normal business has to continue as usual. Some things went very fast but other things take a lot of paperwork in the USA. Especially because we are foreigners and XPS has no history in the USA. Setting up bankaccounts, arranging credit cards and registering a car take forever. For registering a car they need 6 point of identification. The only valid ID we had was a passport, our dutch and international driving licenses weren't accepted. We has to get the health insurrance cards, bankstatements and even get a shopperscard at BJ's to collect enough points of identification. BJ saved us otherwise we would not have been able to pick up our car today. - appartment is ready to move into. The first week in the USA. So many things to tell and no idea where to start. After one week of long working hours we finally have the office up and running. Office furniture installed and infra-structure in place. We have a real nice but small office and the location is perfect. 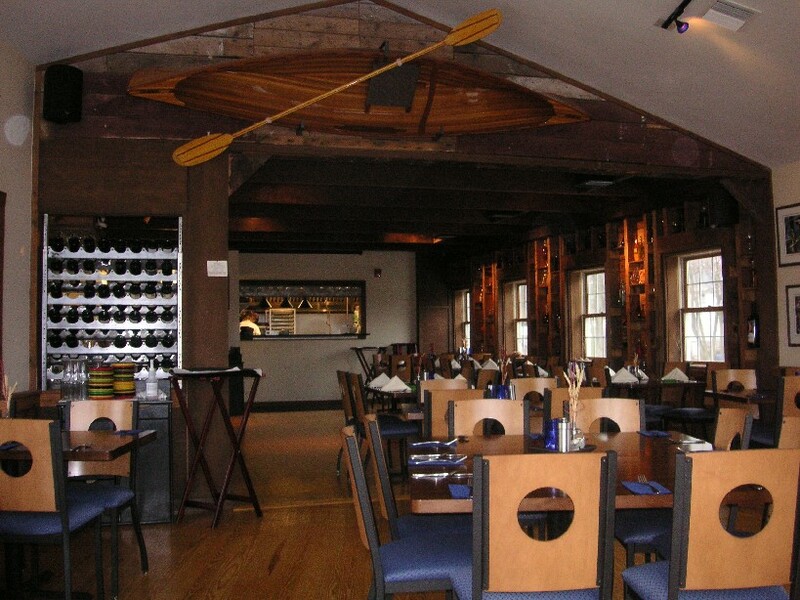 It is located in the center of a small town called Fairport and close to restaurants, bank, post office, and next to a very nice canal (Erie canal). The service we get in the office building is excellent, the concierges are wonderfull and really try to help as best as they can without even asking. Regularly people are stepping in the office to check out what we are doing or to introduce themselves. A very relaxed atmosphere which we really like. The apartment we are rented is fantastic. It is brand new and all high quality equipment and finishing. It is a bit small but on the other hand the view is absolutely priceless. 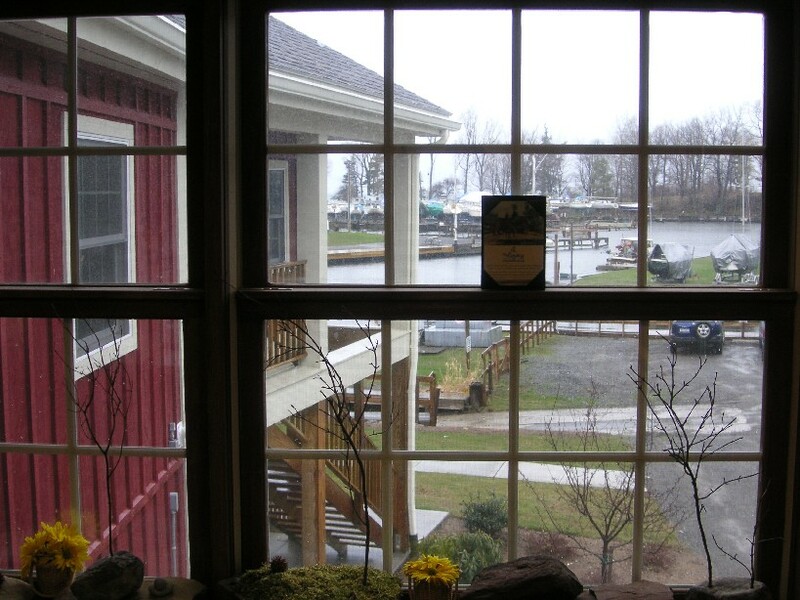 Every time we watch out of our big windows we are surprised by the beauty of the area and the lake. It is so quiet that you can only hear the wind and the waves. The town is very very small (they call it a hamlet) and cars are passing by rarely. Our landlords Ralph and Sue are making us feel very much at home. It is funny how they work at the car dealership. Very inefficient as far as I can tell. They have at least 4 people working on selling 1 car, 1 person to interact directly with the customer, 1 person to make all the sales decisions, 1 person to explain the car manual and screw on the license plates and 1 person to do the payments. It is amazing to see how many people work at a the dealership. The weather is acting very strange. When we arrived it felt like spring time and on Tuesday it started snowing again. At this moment it feels like middle of winter. In the evening it is -7 degrees. In the Netherlands everything starts growing again but over here it hasn't even started. On our way to the airport just before we sold our car to friends of us. We were surprised to see that there was still so much ice on the lake. This picture was taken from the plane just before we arrived in Rochester. 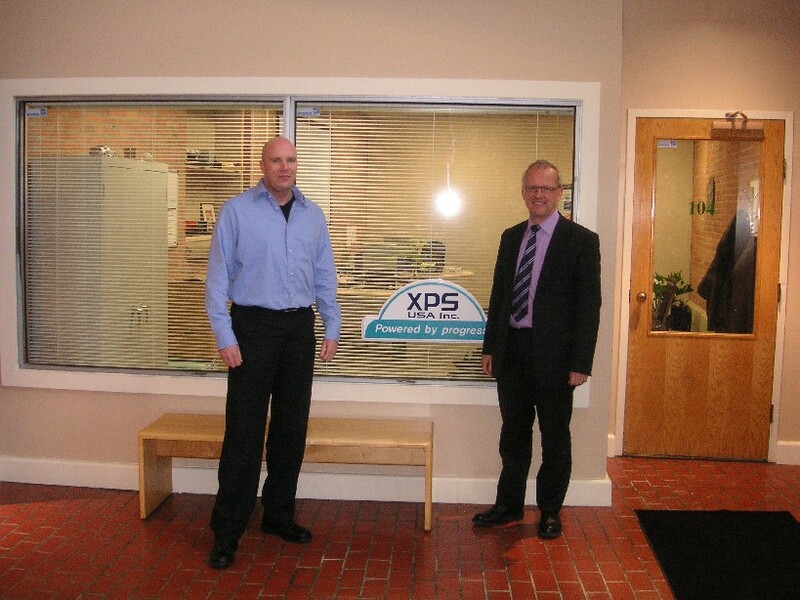 The XPS USA Inc. office in Fairport is up and running after a few days. It isn't finished yet but at least we can work now. Suzanne birthday today so hamburgers for breakfast followed by hash browns, scrambled eggs, pancakes, bacon and french toast for lunch. But she got herself a nice birthday present. This is one of the reasons Suzanne wanted to have the yellow color. Not only beautiful but also practical between all the boring colors on the parking lot near the mall. We thought spring was coming but actually on easter morning it looked like winter wonderland. Nearly 30cm of snow and for the first time we could put the 4 wheel drive to use. On our way to Webster on Lake road we had to chase a few deer from the road. - "grand" opening of our new office during visit of our big boss Jan and our new employee John Garrett. Jan's thinks our office environment is too relaxed with 3 restaurants and a terras. Just envy. - Slowly started normal way of business in Rochester. We are still living in an empty appartment without internet but that will change hopefully with 1 week. This is the inside of the restaurant next door to our appartment. We had lunch there Sunday morning and after that we had enough food in our stomage to last for one day. The XPS sign outside of our office building has been finished. Now it's a bit easier for our guests to find us. As you might see the weather has changed very fast. I think we are going to skip spring and move straight into summer. The weather is really perfect now. Blue sky, sunshine and 20 degrees C. A few days ago we still had snow storms. On thursday we had a meeting downtown Rochester. The company we visited had very fancy offices with a great view on Rochester and the Erie canal. We rarely visit downtown but there are some nice places there as well. Finally on Friday our belongings have arrived. They used one of these small American trucks to bring our stuff. After 3 weeks of camping in our apartment we finally have a place to sit and live. We terrible undestimated the amount of things we had shipped to the USA. Luckily enough the truck driver and our landlord Ralph were so kind to help us otherwise we never would have managed it. It tooks us almost 1 full day to unload the container and move the things in the house. We were also very lucky with the weather. If they had brought it 1 week earlier we would have been in trouble. Some of our things were broken because the loading of the container wasn't done professionaly. Most of the boxes are in our garage so we can start unpacking next week en see whether more stuff has been damaged. View on Lake Ontario 100 m from our apartment. Everyone has lowered the flags because of the terrible shooting that happened this week. This weekend we visited Letchworth park which is located at approx. 50km from Rochester. I have really fallen in love with this park as well as the Adirondacks. Nothing is blossoming yet but is it already so beautiful. I would say it is the mini Grand Canyon combined with beautiful falls. Actually the falls are much more beautiful than the Niagara falls that are very famous for some reason. Letchworth park is 27km long with many activities such as hiking, horse riding, wild water rafting, snowmobile rides, camping and you can take a flight with an airballoon. These are the middle falls and no I didn't gain any weight. Upper falls in the picture below. The lower falls we didn't visit yet. In the picture it is difficult to see but the canyons are really very deep. Approx. 200 meter deep. The weather is going up and down. Today is a very nice day again but last week we had a lot of rain. This weekend we wanted to move some of our office furniture into the XPS office but found out that the Cruiser was a few cm's too short. Therefore we decided to rent-a-van from U-HAUL. What a terrible car. I have no words for this vehicle on wheels. It was a new Ford with 7.000 miles on it but it drove like a ancient Ford. We thought the Cruiser consumed quite some fuel but this car.....I think it did 1:4 maybe 1:5. It seems to me that the price on this car is probably just about right. I wouldn't pay a penny more for it. I covered all windows in such a way that nobody could see me driving it. Amazing that these cars are still build. Reminds me of the VW Santana in China. Today I will show you some pictures of the small hamlet (gehucht) called Pultneyville where we live. We are surprised how few people know this place. Most people in the Rochester area never heard of Pultneyville (or is it our accent?). Our Porch with Adirondack chairs. Salmon creek that flows into Lake Ontario. We have seen some very large fish in this creek. Suzanne already decided not to go swimming in the lake because of these ' monsters' . Pultneyville is very small and has no shops except The Pickle. You can get a lot of things there but the pizza and sandwhiches are great. Although it is a small place they do have 2 churches. The Pultneyville harbour. There is a much bigger harbour 10 minutes from Pultneyville in Sodus Bay. There are several people offering fishing trips from the Pultneyville harbour. One of them is captain Shan who we have met already. I a very nice guy. Below you can see his boat on the left side of the Landing. This is the only bed&breakfast hotel in Pultneyville. It has 1 room. The Antique shop in Pultneyville. Ze noemen het antiek maar eigenlijk is het rommel. In our street a very nice house with a fantastic view. Another nice house. These are the typical houses in this area. All made of wood and very natural.